Not many overseas tourists find their way to Phrae, but those that do are rewarded with interesting architecture, genuinely friendly locals and attractive countryside. The small city of Phrae is the main city in the province which shares the same name and the city makes a good base to explore some of the area’s understated charms. With a rich tradition in handicrafts and textile weaving, Phrae is famous throughout Thailand for its blue mo hom shirts. The region also produces what is regarded as the best quality teak in Thailand and some beautiful wooden houses and buildings can be seen dotted around Phrae. The city of Phrae is divided into two distinct areas; old town and new town. The old town is certainly the more attractive area to stay and explore, but there are some good accommodation options closer to the bus station in the new town area. In the city of Phrae, Wongburi House, Ban Pratup Chai and Wat Chom Sawan are all outstanding examples of teak buildings and craftsmanship. Those interested in architecture or design should also take a look at the Governor’s residence which was formerly the home of the Lords of Phrae at a time when the area formed part of the Lanna kingdom. 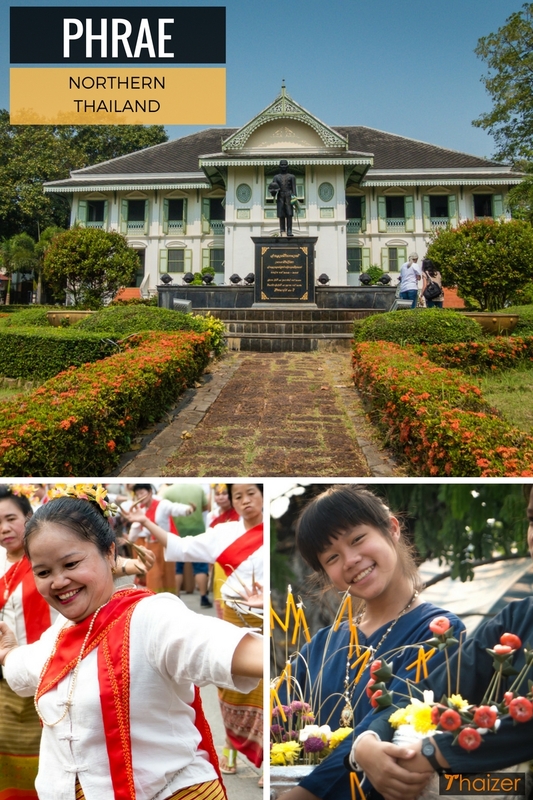 Another fine example is home to the excellent and informative Free Thai Museum located just behind the Paradorn Hotel. The oldest temple in Phrae is Wat Luang located within the boundaries of the old town, but the most revered temple lies approximately 10kms away from the city centre. Local people will tell you that you haven’t been to Phrae until you’ve seen Wat Phra That Choe Hae, a temple which contains relics of the Lord Buddha and which plays host to a vibrant annual festival (held March/April) in which locals pay homage. If you’ve already been to Chiang Mai and Doi Suthep, then this is Phrae’s equivalent. Phrae may lack the more obvious attractions found in other northern regions such as Chiang Mai and Chiang Rai, but that has the benefit of meaning relatively few Western tourists visit here. If you’re looking for an elusive glimpse of the ‘real Thailand’ you have every chance of finding it in Phrae. The old town area is a lovely place to just walk around and enjoy the laid-back charm. If you visit Phrae on a weekend, make time for the Saturday Waking Street Market along Kamlue Road. It’s small and won’t take you too long to walk up and down, but what it lacks in size it makes up with character and you may find you are one of the few tourists there. Have dinner at the night market eating at one of the food stalls that set up close to Pratu Chai (Victory Gate) and practice your Thai language skills with the food vendors. They’re less used to seeing tourists here than other areas of Thailand, but even if you don’t speak any Thai a few smiles and hand gestures will usually get you through. Do try some of the northern Thai food specialities like gaeng hang lay (a tasty pork curry) and khao soi. The easiest and quickest way to get to Phrae from Bangkok is by flying. Nok Air currently run daily services between Bangkok and Phrae (flight time 1 hour 25 minutes) with the diminutive airport located a 10-minute drive from the heart of the city. Buses depart from Bangkok’s northern bus terminal (Mo Chit) with journey times averaging between 8-9 hours. The Transport Company are one of the more reliable bus operators, but private companies such as Sombat Tour also run services between Bangkok and Phrae. The bus terminal in Phrae is located in the new part of town at the northern end of Thanon Yantrakitkosol. The most convenient option from Chiang Mai is to take one of the buses operated by the Green Bus Company with a journey time of 4 hours. From Chiang Rai, frequent buses and mini-buses run from the new bus terminal (Chiang Rai 2) via Phayao to Phrae with a journey time of 4 hours and fares around 150 Baht. There are also regular buses to Phrae from Nan (2 hours) and other northern towns including Phitsanulok (3-4 hours). There are no direct rail services to Phrae, but it’s possible to take a train from Bangkok’s main Hualamphong station to Den Chai (northern line). From Den Chai train station a shared songthaew service runs the 20kms to Phrae. Trains from Chiang Mai also stop at Den Chai, but it is easier and quicker to take the bus from Chiang Mai to Phrae rather than the train. Arriving at the bus station it is easy to find songthaews and motorbike taxis for short trips into town, but elsewhere songthaews aren’t as frequent as they are in bigger cities like Chiang Mai so you may have to be patient or look to find your own set of wheels if you want to explore areas away from where you are staying. Fro more information on things to see and do in Phrae, pay a visit to the helpful Tourism Authority of Thailand office located on Ban Mai Road.